The San Diego California broken bone injury attorneys at DiMarco | Araujo | Montevideo have built a successful track record for their clients since the late 1970s. We want to meet with you to discuss your broken bone injury case, your options and how we can help you maximize your possible compensation under the law. We represent all fracture cases from workers’ compensation claims and personal injury cases to work injury cases. Broken bone injuries and their related treatments and recoveries can be difficult on the victim and their family. We will ensure you get the comprehensive medical care to heal properly and recuperate. To represent your case as completely as possible, we will consult with economists, physicians, accident reconstructionists, and vocational experts. Call us any time day or night at (619) 946-6466 to schedule your free initial consultation and case evaluation. Fracture is another way to say broken bone. When the amount of force that is applied to a bone is stronger than the actual bone, it results in a fracture. Medical professionals abbreviate fractures by using: #, FRX, or Fx. Please call your doctor or 911 if you believe you may have a fracture. Broken bones are not always easy to diagnose. This is definitely true in the case of a hairline or stress fracture. The usual signs of a fracture are: pain, bruising, swelling, and tenderness. Foot Bones: About ten percent of broken bones happen to feet. They are constructed with three sections consisting that include twenty-six bones total. Forefoot Bones: The forefoot has nineteen small bones. Each toe has a distal phalanx that at the tip. The toe’s middle phalanx is next after that. The proximal phalanx is next and it is connected to long metatarsal bones. Midfoot Bones: The middle part of the foot has five bones which include the medial cuneiform bone, cuboid, navicular, lateral cuneiform bone, and the intermediate cuneiform bone. This section constructs the foot’s arch. Hindfoot Bones: The hindfoot is made up of two large bones called the talus and the calcaneus. The talus is the ankle and the calcaneus is the heel. Pelvis Bones: The pelvis has four bones. Hip bone breaks are the most common fracture sites for people 65 years of age or older. The hips are made up of: the ilium, the ischium, and the pubis. Most fractured hips happen due to the affects of osteoporosis: Weakened bones. The other two bones of the pelvis are the coccyx and the sacrum. The sacrum is at the bottom of the spine whereas the coccyx is also called the tailbone. Leg & Thigh Bones: The bone that makes up the thigh is the femur and it is so strong that is able to support over 25 times an average adult’s weight. The lower legs from the knees down consist of the patella, fibula, and tibia. The patella is the bone that is also called the kneecap. The tibia and fibula are found below the knee. Wrist Bones: People younger than sixty-five years of age fracture their wrist more often than any other bone in their body. Wrist fractures usually refer to breaking one or both of the forearm bones (the radius and ulna). The eight wrist bones are in two sets of four bones. One row has the trapezoid bone, trapezium bone, capitate bone, and the hamate bone. The second row has the triquetrum bone, scaphoid bone, lunate bone, and pisiform bone. Hand Bones: The metacarpal bones are the bones that make up the palm of our hand and bridge the fingers with the wrist bones. Each of our fingers has three small bones whereas the thumb only has two bones. The bone nearest to the wrist is the proximal phalanx. The middle bone among the three finger bones is the middle phalanx. The last bone of each finger is named the distal phalanx (our finger tips). Arm Bones: The forearm is made of two long bones called the ulna and the radius. These bones often fracture due to falls or trauma from bicycle, skateboard, car, or motorcycle accidents or sports injuries. Radial head breaks are when the radial bone breaks close to the elbow. When the fracture happens to be in the middle section of either of the forearm bones (not near the wrist or the elbow), it can be referred to as a radial shaft break or ulnar shaft break. The humerus is a very strong bone that makes up the upper arm from the shoulder down to the elbow. Thorax Bones: The thorax is made up of twenty-five bones and is what makes our chest cavity and protect many of our internal organs. Twenty-four of those are the two sets of twelve ribs and the twenty-fifth bone is the sternum. Some will state that the sternum is made up of 3 bones called the gladiolus (body of the sternum), the xiphoid process, and the manubrium. Spinal Cord: The spinal cord includes five lumbar vertebrae, twelve thoracic vertebrae, and seven cervical vertebrae. More detailed information on the spinal cord and what we can offer spinal cord injury victims is found in the Spinal Cord Injury page. Shoulders & Collarbones: Clavicle is another name for collarbone. Its two most important functions are: (1) keep the shoulder up and (2) protect the blood vessels and nerves. The 2nd bone that is part of the shoulder is the scapula or the shoulder blade. There are three types of common scapula fractures: scapula body fractures, scapular neck fractures, and glenoid fractures. Cranial & Skull Bones: The skull includes eight cranial bones. They are: the two parietal bones, the two temporal bones, the frontal bone, the sphenoid bone, the occipital bone, and the ethmoid bone. Facial Bones: Fourteen bones make up the set of facial bones. They include the two maxilla bones or upper jaw, the mandible or lower jaw, the two nasal bones, the two cheek bones (zygomatic bones), the vomer, the hyoid bone in the throat, the two palatine bones, the lacrimal bone, and the inferior nasal concha. Simple Broken Bone Injury: For simple fractures, the bone does fracture but the break doesn’t puncture a hole in the outer skin. A simple break is also called a closed broken bone. Compound Broken Bone Injury: Compound fractures are when the broken bone has actually created a hole in the outer skin. A compound fracture is also known by the term open broken bone. This type of fracture does also carry the risk of a dangerous deep bone infection that is named osteomyelitis. Transverse & Linear Broken Bone Injury: Linear Broken Bones are when the line of the fracture is parallel to the injured bone, whereas transverse broken bones are when the break is actually at a 90 degree angle to the alignment of the bone. Greenstick Broken Bone: Greenstick fractures are when the injured person’s bone has physically bent because of the force but it has not been fully broken or snapped. Impacted Broken Bone: Bones have become impacted when two of the fracture victim’s bones are forced into each other. This happens more to children and older adults since those are the two age group that are most likely to trip, slip, or fall. Pathologic Broken Bone Injury: These are fractures that occur either fully or partially because of pathologic causes that weaken the bones like infections, tumors, osteoporosis, and some other bone disorders. Osteoporosis is one of the most common and it is when the bones are losing old bone cells faster than they can replace them with new bone cells. Displaced & Non-Displaced Broken Bone Injury: Displaced fractures are when the bone fractures and is forced to shift out of its normal location and alignment. Non-displaced fractures are breaks where the bone does not move from its normal alignment and location. Stress Fracture Injury: Stress fractures can be caused by repetitive force against the bones over an extended duration. Poor nutrition and playing sports are some of the top reasons for stress fractures. Commuted Broken Bones Injury: Commuted fractures are when the break caused the bone to shatter into many pieces. Treatment for your broken bone will vary depending on the severity of the break, the location, the type of break and any other injuries that a patient is also suffering from. The doctor may need to set the injured bone and then put a cast around it to help it heal properly. In more complex fracture cases, the use of screws, rods, pins, and plates may be needed. 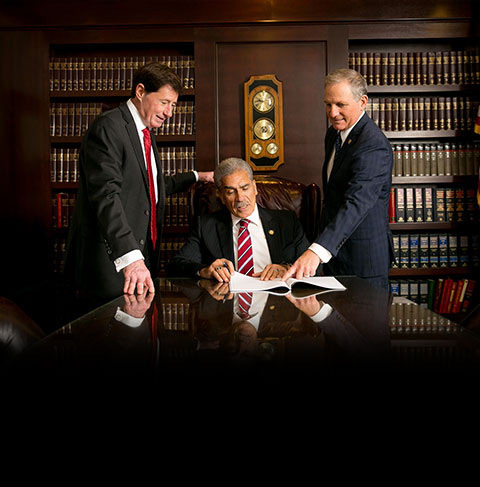 We are available any time of the day to schedule your free initial consultations and case evaluations. In addition to the free initial consultation, we work for all of our clients on a contingency basis where you will not owe or pay us unless and until we win your case. The San Diego work injury lawyers at DiMarco | Araujo | Montevideo will meet you at our office, your house or your hospital room on Monday through Friday between 8:30am and 5:30pm. By appointment, we will even meet with you on Saturday and Sunday and in the evening. Our solid reputation as broken bone injury attorneys that has been built on over thirty years of quality work is known throughout San Diego, California, Ventura, Los Angeles, Orange County, Riverside, San Bernardino, & Long Beach. Thank you for taking the time to visit our webpage and learn more about broken bones and what we can do for you. We hope to hear from you soon so we can start helping you recover.